We’ve just wrapped up the first ever Battle of the Paddle Brazil here on the white sandy beaches of Cabo Frio, North of Rio de Janeiro. Two days of solid SUP racing action that saw everything from storms and wild surf to beautiful sunshine and perfect waves. This was definitely no Doheny but it was certainly a fun adventure, with interesting races, enthusiastic locals and extremely generous hospitality all round. 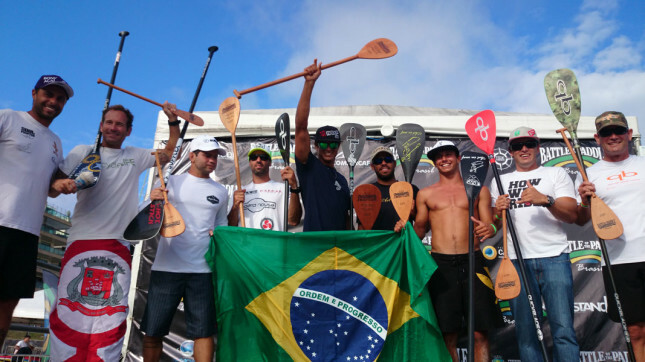 So while it wasn’t the Battle of the Paddle as we know it – missing were Danny, Travis, Annabel, Jenny, Connor and Kai (a combination of a postponed event and clashes on the SUP race calendar) – it was still a spectacle, with the traveling Team Quickblade crew up against the best of Brazil. In the end it was a clean sweep for California’s Brandi Baksic and Mexico’s Fernando Stalla, with the duo taking out both the Elite and Distance races respectively. There was stiff resistance from the local crew though, with the likes of Luiz “Animal” Guida, young gun Vinicius Martins and dark horse Joseph Cerdas stepping up on the men’s side of the draw, while Barbara Brasil and Lena Ribeiro performed well in the women’s races. Saturday we woke to see our week-long streak of beautiful sunshine rudely interrupted by wind, rain and solid, messy waves in front of the main event site at “Praia Forte” (which, fittingly, directly translates to “Strong” beach – exactly what you needed to be to survive the conditions). But at the front of the field, Fernando was pushed early by Luiz Guida (aka “Animal”), perhaps Brazil’s most successful SUP racer to date while one of the rising stars Vinicius Martins and dark horse Joseph Cerdas were also in hot pursuit. A rogue set wave took out the Brazilian version of the “Hammer Buoy” leading to a moment of chaos and confusion as paddlers weren’t sure whether to chase the runaway marker into the shorebreak or follow the virtual course as it was originally set. Adding to the difficulty of the race were the endless sets. For those rounding the inside buoys or punching back out after running the chicane, the sets were a nightmare. Wave after wave after wave, at very short intervals, with a gnarly side sweep for good measure. And surviving the tricky conditions the best was Fernando Stalla. The Mexican Monster, the Sorceror from Sayulita, Fabio, Tarzan, whatever nickname you give him, Nando mastered the course and paddled away on the final laps to record a comfortable win and become the first ever Battle of the Paddle Brazil Elite Race Champion. Fernando also claimed the first win (of what would soon become many wins) for Team Quickblade. Crossing the line second was the dark horse Joseph Cerdas, with local favourite Luiz Guida rounding out the top three ahead of Vini Martins. There were also solid performances from the other Quickblade crew, including the Mad Scientist Jim Terrell and Spain’s Belar Diaz. Shortly after, Brandi Baksic crossed the line to claim the women’s title. Despite being pushed hard by Barbara Brasil, Brandi stood up (pun intended) to finally shake off her bridesmaid tag and take a BOP crown of her own. The San Clemente local has finished runner-up twice (with a further 2x third-place finishes) at the BOP California, so it was great to see one of the Battle originals take out the race. Brandi’s win also made it two from two for Team Quickblade. I was paddling beside Brandi for a lap or two and saw how well she performed. At one point we got caught inside by an endless set. After punching through wave after wave after wave, Brandi showed her strength and powered her way out the back while the rest of us floundered. So that was the Elite Race. Pretty gnarly. A big turnout for the Open Race followed, before the sun finally reappeared and we were treated to a perfect afternoon on the beach. Sunday morning we again woke to see clouds above, but fortunately this time the weather swung the other way, with the sun soon popping out and most of Day Two becoming a beautiful, hot, sunny day on the beach. The Distance race was first up, with conditions a hundred times better than what we endured in the Elite Race the day before. Perfect temperature, smaller and much cleaner surf, no crazy winds and a clear race course for us to tackle. We started at the Northern end of Cabo Frio, inside the protected headland, then gunned it straight South along the beach. The Elite course was two laps of a 6km loop and with small bumps providing a slight downwind/headwind experience, it made for some very tactical racing. Once again Fernando Stalla took off like a rocket, hoping to break the field straight away and avoid any draft train scenarios. But keeping pace was Vinicius Martins, who, at just 17 years, will definitely be a name to watch in the future. The two leaders went toe-to-toe for almost the entire race, paddling in parallel and never drafting as each of them looked to break the other. Eventually Fernando slowly moved clear and held on to win by 30 seconds, giving him a perfect clean sweep of the Elite Races. Vinicius came home for a well deserved second place, while Jo Cerdas proved his runner-up performance in the Elite Race was no fluke by taking third. From there it was an intense battle for the minor placings. The Quickblade duo of Jim Terrell and Belar Diaz, as well as yours truly, an honourary QB team member for the weekend, were working as a trio and sitting comfortable in 4th, 5th and 6th for the first half of the race. But then three locals, led by New Zealand-based Brazilian Felipe dos Santos, worked hard and closed the gap just as we rounded the halfway mark in front of the main event site. That made it a group of six guys battling for 4th position. Personally I actually thought we were about to finish the race right then and there. My mind must have been miles away during the race briefing as I had no idea we were doing a second lap. I clearly have no concept of time either, as we’d only been paddling for about 35 minutes at that point so I’m not sure how I could have thought we were about to finish a 12k race. But I did. So when I saw the five guys in front of me round the mark and start heading back away from the finish line and into the distance, my heart sank and my mind broke. I immediately lost the train and started drifting back through the pack, eventually meeting up with a fast-moving Brandi Baksic, who had been paddling solo the entire race and was in command of the women’s field. Brandi and I would have crossed the line together if it wasn’t for the set of the day rolling through just as we rounded the final turning buoy and headed for the shore. Neither of us were wearing leggies (leashes) but both of us decided to try our luck on the bomb set of the day. And both of us ate it. Despite swimming the final 100 metres of the race, Brandi hung on to make it a double victory and give Team Quickblade a perfect four from four. Apart from Vini and Joseph taking 2nd and 3rd, it was also a fine performance from QB’s Belar Diaz in 4th, while the Mad Scientist himself showed that he’s not getting any slower with age by finishing near the lead chase group. Felipe dos Santos’ 5th place finish was also impressive, given he had spent so much energy pulling the second draft train back up into contention on the first lap. But the event wasn’t over there. Still to come were the stoked grommies in the Kids Race, while bragging rights were on the line in the Team Relay. The relay race was a lot of fun. Team Quickblade, who had quickly become the stars of the event, stacked their team with champions Brandi Baksic and Fernando Stalla, along with the strong Spaniard Belar Diaz. The fourth spot (and anchor leg) was somehow handed to myself, with Jimmy Terrell graciously stepping aside to take on the position of team coach and chief motivator/beer-drinker. At the start, Fernando led out for Team QB while young gun Vinicius Martins kept pace for the Art In Surf crew. The two gained a big lead on the first leg and tagged the second paddlers at the same time. Brandi Baksic then gave the Quickblade squad a solid lead on the second leg before Belar Diaz solidified it on the third. From there it was up to me to just not-screw-it-up. We had a minute or two advantage as I jumped on the board and headed out through the waves, and all I could think about was that I better not fall off in front of my teammates and the rather large crowd that had gathered to watch the spectacle (the beaches are packed around here and this was obviously the biggest show in town). Fortunately I somehow held my balance and Team Quickblade crossed the line in first, capping off a great weekend for the traveling crew while also enjoying a super fun race that summed up the spirit of the event. 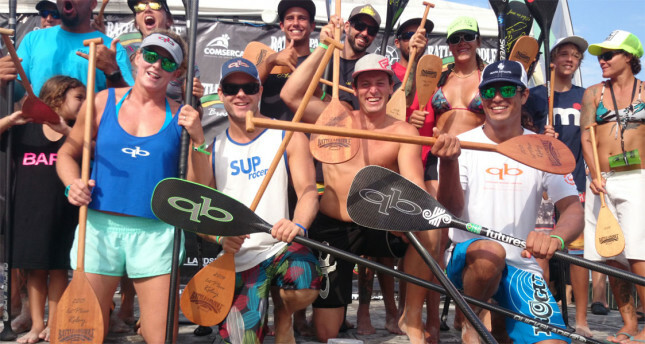 So that was the first ever Battle of the Paddle Brazil. Team Quickblade swept the inaugural event, however the local talent on display makes it pretty obvious that Brazil is going to be one of the leading SUP nations in the future. In a similar way that countries like France are filling up deeper and deeper with talent, it probably won’t be long until Brazil starts giving the traditional powerhouse regions of Australia, California and Hawaii a good run for their money. It wasn’t the BOP as we know it, at least not as far as ‘level of competition’ is concerned, but it was a lot of fun. Different brands, different teams, different countries, different countries, all coming together for the love of paddling. New friends, old friends. Lots of fun on the beaches of Brazil. And as the Quickblade Paddles motto goes: Train Hard. Go Fast. Have Fun. Huge thanks to the organisers for looking after us, as well as the Quickblade Brazil / G-Zero crew for treating us like kings in their home country. We’ll be back for sure next year and I think a lot of the pros will be as well.